(Visit the Art Sculpture of a Flying Horse Pegasus). If you believe that Pegasus was a Myth told by the Greeks you might be mistaken. 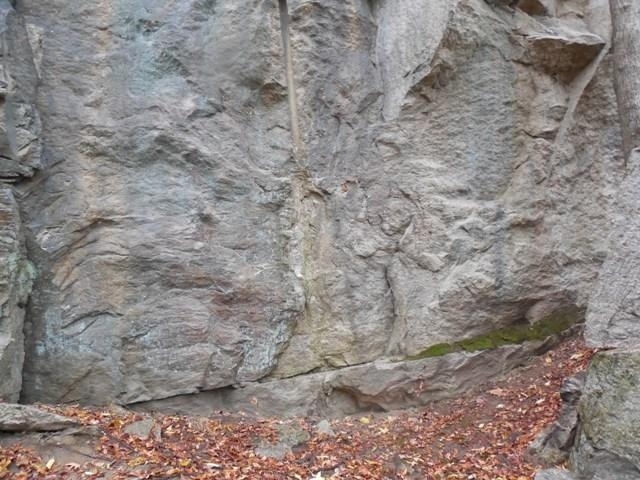 On Bells Isle in Richmond Virginia this video may prove that this Artist who carved this Pegasus in this cliff possibly 20,000 years before the Greeks were born carved it for us to see what this artist saw and what this artist knew about Pegasus. To this Artist Pegasus was a flying horse and was no Myth. What do you see? Come to Richmond Virginia and see Edith Katherine’s Pegasus; She is worth coming to see If you love Horses. You will love America’s only Art Carving of this size of a Flying Horse Pegasus. Copy this picture of the Edith Katherine’s Flying Horse Pegasus and the picture with the entire climbing wall so you can best be able to see this Art Sculpture. This picture was taken on a rainy cloudy day and that is the best time to view this Pegasus. You can also see her very clearly early in the morning 6 am until 9 am until around noon time, then the higher and brighter the sun, the less visible she becomes. So see her in the morning as the sun is rising or in the evening as the Sun is setting. Then walk across the bridge on Bells Isle and see one of the most beautiful Sunsets over the River that was also looked upon by Ice Age Europeans many years ago. Have a wonderful time and come back each year to explore the James River with John Gabriel, He’ll be waiting for you to make a wonderful discovery too. Click here to allow John Gabriel to show you the Flying Horse Pegasus at Bells Isle. Listen and watch closely. Listen to John Gabriel’s step by step depiction and pay attention to all that is explained. Then go back and look closely to see if you see the same portrayal by John Gabriel in the picture of the Flying Horse Pegasus as he details in the video of the Flying Horse Pegasus Video. Some say that the cliff was drilled and blasted and that happened to just end up with a horses face and an eye exactly where an eye would be carved on a horse and legs symmetrically carved in the cliff a distance exactly the same distance apart from where the Pegasus’s Head is carved; that is one heck of a Blast and the odds on that is Silly. It is silly to even mention that this is not of Human Origin. Find me a Rock anywhere that has Wings, legs, a head and a baby café right above the thigh in a marsupial pouch all in a carved symmetrically distance as a horse size and this one is approximately 7 foot high by 20 foot long. John Gabriel will be waiting? So far no one had come up with a Fly Horse carving in any rock any where. We’re still waiting? The first Ice Age European 100 Ton Art Sculpture that John Gabriel discovered was by accident. A slippery rock on the bottom caused John Gabriel’s head to go under the water, the James River current pulling him down and as he moved forward to get some air and standing in front of this huge rock, John could see the V shaped of the nose of the Walrus; he began to see the Walrus head and the depth of the carve nose and then John Gabriel could hear over and over the words of Archaeologist Dr Dennis Stanford, “Whale, Walrus, Harp Seal, these Ice Age Men could of made it to America first”. These words kept ringing in John Gabriel’s ear that he knew this 100 Ton Walrus Sculpture would prove to Americans everywhere that he did not carve this stone art sculpture. After Hugging the Walrus for several minutes, the sensation of knowing I was the first to set eyes on the Stone Sculptures from people who survived the ice age to America, leaving 100 ton stone art sculptures. I was the only one who knew it was an emotional feeling pouring through my entire body. It was like knowing that this Civilization left a message for someone to see and after 48 years of exploring, snorkeling, and studying, I was the only one to have the vision to see the incredible message they left for all of America; the most beautiful art sculptures in the World; Carved 100 Ton Sea Mammals as they honored the lives of the sea mammals as it allowed Ice Age Man to survive the journey. What a Cool wonderful civilization, thanks to the video’s of Dr Dennis Stanford, what a cool wonderful Archaeologist; the Best of the Best he is and it took a pretty Cool person to find America’ 1st Lost Civilization too; John Gabriel. Hope you will come to Richmond Virginia to meet him; He’ll be on the Rocks somewhere on the James River. This is one of the most beautiful Art Sculptures that is unmistakable to see. A Snapping Turtle over 100 Tons which is a clear indication; observe the artist hand carved mouth line on the Snapping Turtle’s Head, the eye, the snout, the legs, the proportional shell size to the leg size and tail located where it should be on the rear of the shell that No Doubt allows you to know this is a Snapping Turtle. Our first photo you see on RiverCitySeaMonsters is a Bald Eagle’s Head facing to the left. It is easy to see the nose, the eye and the long shape of the head to the beak. John Gabriel’s Webmaster Troy Smith asked me why he wanted him to stop the video on this shot. John replied, because he cannot find that Art Sculpture. He filmed it but forgot to take a photo of it. He’s been searching for it for weeks this summer but wasn’t able to find it. In 1970’s John had found one large pointed rock that he had searched for years before spotting it once again in 2013. When the depth of the water changes, what you may see on any day may not be seen again the next time. As the Seasons change, the rocks for weeks will become covered in a slippery green Moss grass. During the Spring, the visibility of rock shapes is more noticeable as the Moss grass died off. The Frog is one of the sculptures that will make up your mind quickly and say – I can see it. I can see it. You can too. This photo is a good way to explain why a sculpture will appear and look like one thing when the James River level is at one depth, the sculpture may be easier to understand and look like another when the River level changes. For months when the James River was higher John Gabriel could not identify this sculpture. It was not related to the Whale, did not look like a Walrus, not a Turtle either. So, What was it? It had a pointed head but had a tail in the winter time when this picture was taken and the water level higher. As the James River receded or had a lower level of depth, John Gabriel could see a larger rounded head; then he was able to identify this sculpture. Frogs are carved everywhere so this was an easy one once the James River water level went down – What has a big round head and a thin tail that is related to a Frog John Gabriel thought- Yes, it’s a Tad Pole. As You can see The first picture of the video shows a bigger rounded than the picture where the head is more pointed and there is more mud on the Stone Art Sculpture. Go to Search Engine and Google Mark Holmberg CBS James River Lost Civilization. You will see this same Tad Pole Stone Art Sculpture in Mark’s report. Mark reports and films the James River and some of the History of the James and other parts of Virginia. Marks expertise is in his ability to make those people he films comfortable as if the camera and a report is not taking place. Mark takes himself out of the lime light to allow the report to focus on his material. John Gabriel was on this Whale rock for over 30 years and never noticed it as a sculpture. For 10 years he recognized it was a Art Sculpture but could not clearly identify it. Then on almost the day he filmed it he was able to realize that one side of this sculpture was underwater and showed the long lower jaw of a Whale. The Sunshine Boys from Fairfax Virginia made occasionally drives to Virginia Beach; but many times they ended up on the James River in Richmond; All there called it the Rocks. A place where teen age boys and teen age girls could jump into the rapids and hold on to each other as they flowed together at a fun fun pace. Occasionally finding a Big Rock to hide behind and share a Kiss or 2. Wow, wish I lived in Richmond I thought. Then one day as I stood on the bank of the James River, I yelled out, hey that Square Rock didn’t get Square on it’s Own, someone had to Carve It. A few boys laughed and made fun of me in front of the Girls; and that’s all it took to make me remember how those few boys made fun of what I believed to be true. 48 years later, that Square Rock is still there and so are the teen age boys and girls jumping into the rapids and sharing a Kiss or 2 behind those Big Rocks. Only thing is now we know what those Big Rocks really are; 20,000 Year Old Ice Age Stone Sculptures – Sometimes Sculptures are not on the minds of young people; When you ask the VCU& U of R Girls from Richmond who go to the Rocks (Pony Pasture) each Spring when the Boys who have been working on the weights all winter long, with dark tans and their body muscles sweating in the Summer Sun standing on the Big Rock Art Sculptures – would you see the art sculptures? Or would you be looking at the Boys? Many times the Girls scream out at the same time – We sure aren’t going to be looking at any rock sculptures! Girls will be Girls. Come to Richmond, Virginia and see what you see? Along the James River at Bells Isle there is a small lake, old rock quarry where stone was drilled and blasted on the stone cliffs in the 1800’s. A few Art Sculptures have survived. Look at the cliff and you will see textured rock holds enabling people to climb the cliff. To the left of that climbing wall, on the left a tree and to the left of that a Smaller tree. Behind the smaller tree you can see a Flat large Rock supporting a 3-5 Ton Pointed Rock, an Arrow point symmetrically carved on the left and right and concave in middle, with a straight line from the top of the point to the concave area - this Sculptured Arrow Point, a Rock carved to warn those who may come to the top of the cliffs where Ice Age Europeans families lived, if they mess with their families they’ll get one of these spears thrown at them, the Ultimate weapon back then; Click on the Video and see this Sculptured Arrow Point which is balanced by 3 rocks about the size of a football. Can you see the 3 small scrapes just above the small rock to the right between the one large rock on the ground and the Arrow Point on top, look to the right and focus on the Owl which is carved in the concave area. It’s a wonderful Art Sculpture to warn those intruders of the Ultimate weapon – a Spear Point. Help RiverCitySeaMonsters to preserve this wonderful Art. Can you see the Horses Head facing to the left. This has been copyrighted at the Library of Congress in 2012 when only the head was discovered. The following year, on a rainy day, a photo was retaken by John Gabriel. Once enlarged he could see the chest and legs of a Horse. He thought the other side of the photo looked like a Bird. Then he noticed the fat legs of the Horse, and then saw the hoof of the back leg. He realized then that this was a Pegasus; the fat legs having feathers over them, then seeing the front wing carved into the cliff, the over head wing and to the rear behind the back hoof. John Gabriel could see the feather effect, the back tail feather. It was a surprise to see the artist make clear three distinct carvings; first the mouth and nostrils of the Pegasus are flared out as if she is breathing hard; and she has a Humming bird wing beside the tail feather; and above the back hoof you can follow up her leg; and see her thigh; amazingly she has a baby café in a marsupial pouch just above the thigh. A quick look at John Gabriel and his VCU Final 4 Shirt. John Gabriel was blessed to be able to go to Houston with his Dad and their first time attending any Final 4 event. One of John Gabriel’s friends of the James River filmed this – come to the James River and you will also meet many friendly people who will soon become your friends too. This video shows John Gabriel cleaning off the graffiti from those that do not know that they are using their creative art to cover up the art of Ice Age European Man 20,000 years ago. These creative graffiti artist I know would not cover up our nations art work of 1st Americans and History of Man who also love art as they do. This is a very large tree that smashed against the rocks on the river bank at the Pony Pasture. If trees this large smash against the many Stone Art Sculptures at the speed the flood waters move them, Yes, they can destroy Art, 100 Ton Art Sculptures of Ice Age European man; History that RiverCitySeaMonsters.com is trying to preserve. Please donate so we can begin to afford to bring attention to America’s 1st Lost Civilization full of Art and Art Sculpture.